Read here about a pavilion built on tensegrity principles by the University of Tokyo. The pavilion was conceived in October 2012 at the University of Tokyo Graduate School of Department of Architecture and Architectural Engineering Yusuke Obuchi laboratory and Atsushi Sato laboratory. The Obayashi Corporation, whose fabrication shops are located near the Toyota Motor factory, played a key role in the implementation. 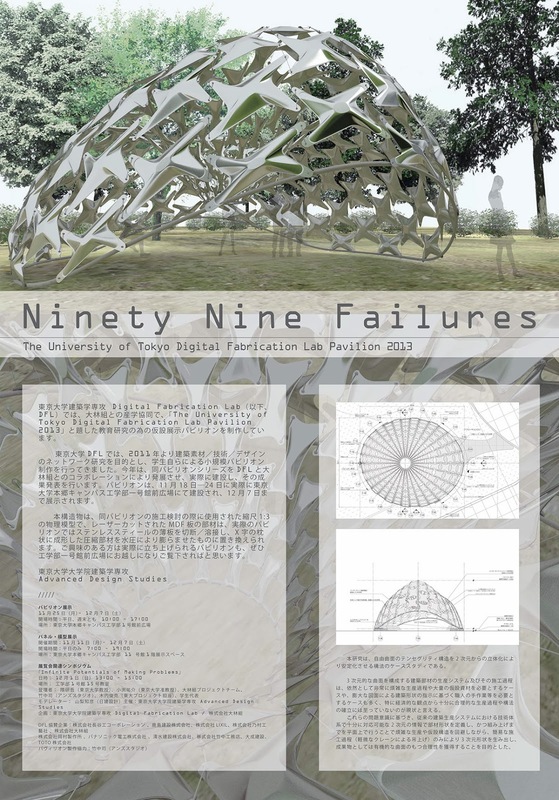 caption="Title Page for Ninety Nine Failures Pavilion, University of Tokyo, December 2013." link="99 Failures Pavilion Photo Gallery"
For an extensive collection of photos, see the 99 Failures Photo Gallery page . The project was named "Ninety Nine Failures" in a nod to acknowledging the role of failure in urban design. With this name the designers paid homage to the role of failure in exploratory design. In the design process, the designers repeatedly tested different structural models to find a geometry that could smoothly transition from a flat, two-dimensional surface into a sturdy 3D form. The compression strut is based on a perpendicular "X" form, rounded out into a pillow shape. Each metal component was carefully spaced apart to allow light to pass through and to minimize the impact of wind loads. Digital mockups were created in Grasshopper and Kangaroo to simulate the tensegrity model and assembly process. The designers are built a physical 1:3 model from laser cut materials to study the behaviors of the tensegrity test the tension cables. This model tested the accuracy of the structural simulations. The process of assembly remained the same as our last model, with multiple marionette ropes to hoist the entire structure in one go. The structural simulations turned out to be a lot more complicated than expected, and the structural engineers from Obayashi Co. were critical to the success of the project. In addition to material research in computational fabrications, the team experimented and fine-tuned the assembly system. Instead of putting the components on site piece by piece, all of them are linked together to create a 2D surface first and then lifted with a series of cables to form a 3D shell structure. The assembly process is analogous to the way marionette puppets are manipulated by a handheld frame, suspending the puppet by threads. Prestressed cables pull together layers of thin stainless steel sheets welded together and inflated with hydraulic pressure to create the shape of inflated metal pillows. The task of attaching the cables proved particularly challenging due to the bulk of the assembly and stiffness of the components and cables. After the materials were assembled on site, a crane pulled the structure upright into its final form. The pavilion stood outside the University of Tokyo Digital Fabrication Lab at the end of 2013. This page was last edited on 18 November 2018, at 04:23.